If you believe that breast milk is the best food choice for your child, but you are not able to breastfeed, or you don't want to, what can you do? That's where exclusive pumping comes in. Exclusive pumping is a great way to provide your baby with your breast milk without putting the baby to the breast. Exclusive pumping is also called EPing and breast milk feeding. It is the process of removing the breast milk from your breasts at regular times throughout the day. You can then give that milk to your baby either by a bottle, tube feeding or through another alternative feeding method. But, exclusive pumping isn't necessarily an easy thing to do. It can be time-consuming and exhausting. Plus, it can often be challenging to continue to pump exclusively for a long period of time. Of course, the longer you can provide your baby with your breast milk, the better it will be for your child. So, here you will find some information and tips to help make exclusive pumping a little easier. You have a premature baby in the hospital NICU who cannot breastfeed. Your baby has difficulty latching on to your breast. You have to return to work or school right away. You are worried about your milk supply and prefer to see how much your child is getting. Breastfeeding is extremely painful, but you can tolerate pumping. You have multiples: twins, triplets, or more. You simply do not want to breastfeed. The number of times a day that you should pump depends on your child's age. A newborn will take a bottle of breast milk approximately every 2 to 3 hours around the clock. So, during the first few weeks, you should try your best to pump at least every 2 to 3 hours—about 8 to 12 times each day—to stimulate your body to produce a healthy milk supply. As your baby gets older, he or she will take more at each feeding, but go longer between feedings. As long as your milk supply is plentiful, you may be able to go longer between pumping sessions, as well. At each session, you should pump for at least 15 minutes on each side. It can take a few minutes for your milk to begin to let-down, so give yourself enough time. You also want to try to fully empty your breasts since this is an important part of stimulating the production of more breast milk. After you drain your breasts and no more milk is flowing out into the collection container, continue to pump for one to five minutes longer. Since breast milk is made based on supply and demand, the extra stimulation will tell your body to make more. You don't have to go longer than 20 minutes, though. Pumping for 15 to 20 minutes more frequently throughout the day will generally produce more breast milk than pumping less often for more extended periods of time. During the first few days after the birth of your baby, you will only be able to pump and collect a small amount of colostrum. Colostrum is the first breast milk. It is concentrated and very nutritious, so a tiny amount is all your baby needs. After the first week, you should be able to pump two to three ounces every two to three hours, or about an ounce an hour or 24 ounces in a 24 hour period. You would need to double this amount if you have twins, triple it for triplets, etc. After about one month, you will need approximately three to four ounces every three to four hours, or about 24 to 32 ounces a day. By the time your baby is six months old, he or she will need about six to eight ounces every four to six hours, so approximately 36 to 48 ounces a day. It's easier to overfeed your baby when you're bottle feeding in place of breastfeeding. So, be sure you're giving your child what he needs every day and in each bottle. There's an easy 3-step formula you can use to calculate how much breast milk to put in a bottle. It can be tough to maintain a healthy milk supply when you're exclusively pumping. It requires a good deal of dedication because you have to pump regularly and, if possible, during the night. Here are some tips for maintaining and increasing your supply. Invest in Your Breast Pump: Moms who pump exclusively spend a lot of time attached to a breast pump. So, think about buying or renting a high-quality pump that is designed for long-term, daily use. A double-pump will serve you well and save you time and energy since it can collect milk from both breasts at the same time. Whichever pump you choose, be sure it's comfortable and the pump shields fit you well to prevent pain and damage to your breast tissue. If you maximize your time and comfort, you're more likely to pump regularly to maintain a healthy milk supply. Pump Frequently: Frequent pumping stimulates the production of breast milk. While your child is a newborn, try to pump every two to three hours. As your child grows, you can usually pump less often. However, if you're struggling with a low milk supply, pumping more often can increase milk production. Try Some Galactagogues: A galactagogue is something that helps a breastfeeding mother make more breast milk. There are plenty of breastfeeding superfoods, herbs, and teas that you can add to your daily diet to support and promote lactation. When it comes to the prevention of pregnancy, exclusive pumping is not the same as exclusive breastfeeding. The lactational amenorrhea method (LAM) of birth control may work during the first six months of exclusive breastfeeding, but it is not considered effective with pumping. Therefore, if you do not wish to become pregnant again right away, you and your partner should use another form of contraception. Be sure to let your doctor know that you are exclusively pumping, though. Since some forms of birth control contain estrogen, they can cause a decrease in your milk supply. Exclusive pumping can be time-consuming and demanding. Fatigue and stress can make you rethink your decision to pump, and they are known to decrease the supply of breast milk. So, it's important to take care of yourself. Try to eat well, drink plenty of fluids, get rest when you can, and relax with your feet up while you're pumping. Also, don't be afraid to ask for help from your partner, family, and friends. A little help and support can make all the difference when it comes to how long you continue to pump exclusively. Forinash AB, Yancey AM, Barnes KN, Myles TD. The use of galactogogues in the breastfeeding mother. Annals of Pharmacotherapy. 2012 Oct;46(10):1392-404. Shealy KR, Scanlon KS, Labiner-Wolfe J, Fein SB, Grummer-Strawn LM. Characteristics of breastfeeding practices among US mothers. Pediatrics. 2008 Oct 1;122(Supplement 2): S50-5. 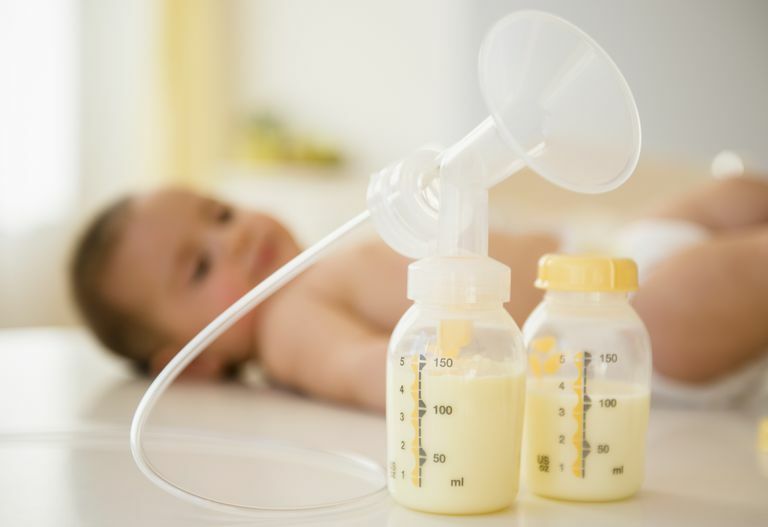 How Much Breast Milk Should I Pump for My Preemie? How Often Should I Pump Breast Milk for a Preemie? How Can You Make Breast Pumping Easier?